They say seeing is believing. If you need help to see while you draw or paint then you should invest in a desk lamp. But there are more brands and types of lamps to choose than you can imagine. So how do you know which one is best for you? Well you could spend hours doing time-consuming research and go out and compare options. Or just let us do all of the research for you! And yes, I’ve done just that. While not every desk lamp is going to be a perfect fit for every artist, I think you will find a perfect fit somewhere in this guide. This lamp has it all. It sits on a sturdy base and offers touch control with a dimmer. You will also find a USB port for charging your devices as well as five brightness levels. The idea is simple: go out and purchase a desk lamp. In reality, though, this isn’t as simple as it seems. There are several features you need to consider before making a purchase. Your budget is going to be a factor, of course. However you will need to invest in a desk lamp that is going to provide more than just a source of light. Artists will need a lamp that can adjust the color and brightness at different times. What makes a good desk lamp for one person will be the wrong lamp for the next. So what should you look for when buying a desk lamp? How it’s mounted. Some lamps clip onto a surface and are designed to be portable. Others have a base or stand and take up precious real estate on an art desk. Neck adjustability. Some lamps are fixed, others have pivot points in certain spots, and others can be twisted and positioned in any direction. Power options. Do you prefer a click switch or a toggle on the power cord? You may even prefer a touch control and not have to worry about switches at all. Size matters. If you have limited desk space you may want to pay attention to how large (or small) the lamp is. Bulb type. LEDs are popular because they can be adjusted. Some bulbs radiate heat that may not be wanted, while others may be too dim or too bright. Color and style. Just because it’s a lamp doesn’t mean it can’t add to the aesthetics of the room. Do you like modern designs and bold colors? Or maybe a standard design and muted colors? Lots of choices and only you know what you like. It is completely up to you what you really want in a functional desk lamp. If you need storage space, for example, there are lamps that come with cup holders for pens and pencils. You may find you need a certain type of bulb to get the type of lighting you’re after, or maybe you want one that looks like it came from the year 3025 as a conversation piece. Whatever you want just remember one thing: as you make your list be sure to focus on what is truly important to you. So now let’s take a look at the best desk lamps for all types of artists. Keep your list of desirables in mind as you browse so you’ll know exactly what you want when you see it. This LED desk lamp from TaoTronics checks all the boxes. 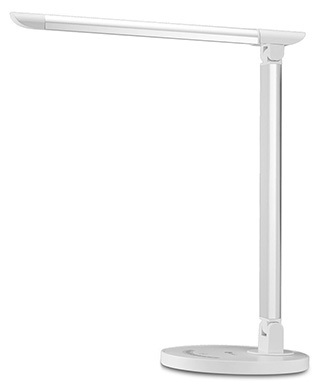 It’s a fully adjustable lamp that takes up a relatively small amount of desk space. 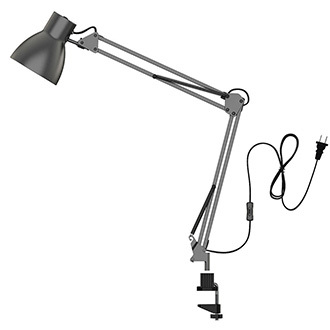 This lamp has a 12.5-inch bulb arm that pivots to 135 degrees at the neck. And it moves another 150 degrees at the base so it’s got a lot of room to stretch. Not only that, but the bulb arm itself will pivot 45 degrees around itself and the base will rotate 90 degrees. With this level of adjustment you can create a stick light or a far-reaching bulb for medium to large sized desks. The touch sensors turn the light on or off and adjust the brightness level with ease. There are seven different levels of brightness for each of the five different lighting options. You can choose from natural light, cool white, white, yellow, or warm yellow. In case you lost count that is a total of 35 different lighting tone possibilities. The round base is small and won’t take up much room sitting on the corner of your desk. The base is weighted, though I would like to see a little more weight behind it. The base tends to wobble when making adjustments to the angles too. You will find a USB port in the rear of the lamp’s stand as well. This will help free up cables and space when you need to charge your mobile phone or tablet while working. The DC adapter also plugs into the rear of the stand. The lamp itself is made of an alloy casing and aluminum for heat dispersion as well as being an aesthetically pleasing lamp overall. One of the nicer finishing touches is the illuminated power button on the base. Even when the lamp is off and it’s dark in the room, you will be able to see where to touch to turn on the lamp. Great design for sure. 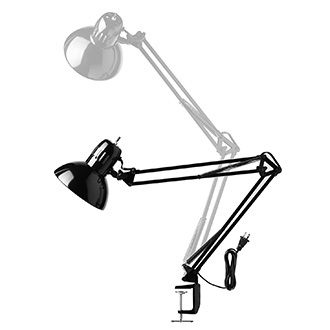 If you are looking for an adjustable lamp then architect lamps are hard to beat. Specifically the A16 from YOUKKOYI is a fully adjustable desk lamp that takes up almost zero desk space. 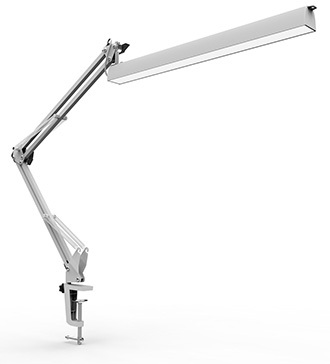 The clamp-on lamp is adjustable at five different pivot points for many position options. When you have the lamp set how you desire, you tighten the wing nut screws at the pivot point to secure the lamp in that position. The LED bulb is also adjustable. Not in position, but in brightness. There are three levels of brightness you can choose from: low, medium and high. In low light the bulb produces 17 lumen. Medium and high produce 170 and 360 lumen respectively. The power supply is a simple USB brick. You can power the lamp from a laptop computer, USB power cell, or plug it into the wall with the provided adapter. Easy peasy. There are two points of concern that I found with this lamp though. First, the clamp needs to be flush with the top and bottom of the desk surface. If there is any deviance the clamp will wobble. However once you have it secure the clamp will not move. The other point of concern is the bulb arm pivot point. It will be the most used adjustable joint in the lamp and after only a few uses it can feel loose. Granted this is a very simple fix: just tighten the mounting screws again. Although this can become tiresome after a while if you’re changing positions a lot. 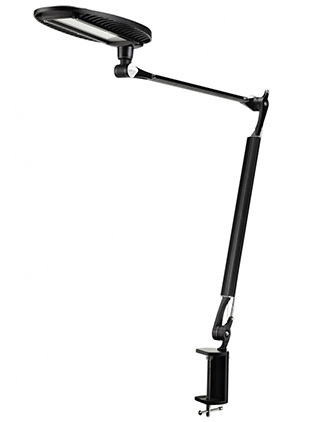 This 32-inch adjustable desk lamp by Globe Electric is a much taller lamp than those I’ve already covered. It has three pivot points: one at the neck, one on the shaft and a spring-loaded arm at the base. This lamp is also a clamp on style but it doesn’t require a bubble level flat surface. The metal screw-adjusted clamp will expand to accommodate desks and mounting areas up to two inches thick. So measure the side of your desk before looking into this guy. Unlike most of the others on this list, this lamp requires a more standard light bulb. You will need to purchase an E26 style medium base bulb. The good news here is that choosing your own bulb(maximum of 60 watts) lets you to select a color tone and brightness that suits your needs. The power switch is a twist dial located on the bulb housing which is very tactile. You can easily feel when it’s in position. You also have the luxury of a six-foot power cord to reach just about any outlet near your desk. Drafting tables don’t offer a lot of room for desk lamps. Their ability to raise and lower also makes mounting a lamp difficult. This is why architect clamp lamps, like the OxyLED T4S, are so popular with artists(both students and professionals). The OxyLED T4S features a manual clamp with a tiny footprint. Not only does it maximize your desk space, but it will also move with your desktop providing you light at any angle. What really caught my eye with this one is the energy savings it provides. With a cool 4000 kelvin LED bulb and a touch plus switch style power control you will spend more money in paints over a week than this lamp will cost you in energy all year. Once you click the power switch located inline with the power cord you can control the bulb with a touch of your finger. Located on the bulb cap is a single button. One short press will turn the bulb on or off. A long press will adjust the brightness level. More impressive, though, is that when you turn the light off it will remember your settings for the next time you turn it on. The LED bulb is flicker-free for better suitability to your eyes and the bulb cap is vented to disperse heat more efficiently, producing a cooler bulb and a longer bulb life. You can expect up to 50,000 hours from the bulb in the OxyLED. 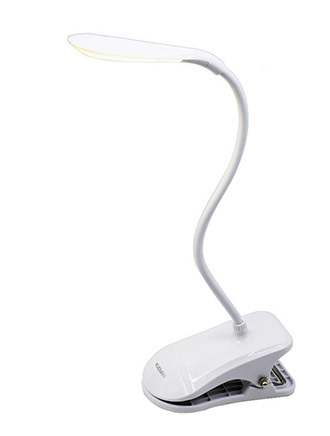 I normally wouldn’t add a reading light to a list of desk lamps for artists and painters. However the KUDIAN clip-on is a remarkable lamp that is worth a mention. It is true that the lamp is pretty small. The light output, however, is large and adjustable. The entire neck of the lamp is bendable and you can even rotate the bulb cap to accommodate different angles. It is a clip-on lamp. However if you only use it in a desktop environment it will stand on its clip like a base. Not only that, but it is battery operated which means you can take it anywhere without having to look for an outlet. The clip will expand to attach to any surface up to two inches thick. You can put it on bed posts, desktops, bookshelves, nightstands, or anywhere else you happen to be doing your work. I like the versatility here, especially as an artist that likes to move from the bed to the desk and back again. The long life soft white LED bulb produces 4000 – 4500 kelvin light and is adjustable. You press the base and the light toggles on & off. If you long press the light it’ll get brighter. If you take the two hours to fully charge the battery and leave it on the highest brightness level, the battery will last you about two and a half hours. Long enough to finish that late night project that’s due in the morning. The popularity of architect lamps continues with this design from ToJane. 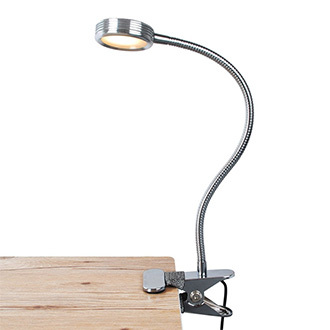 This swing arm desk lamp is a clamp lamp with three adjustable pivot points. The difference here is the height advantage and the construction materials. Each of the three joints are constructed from alloy and aluminum for a long-lasting mechanism and heat dissipation. The bulb housing also has heat dispersing features which holds an E26 style LED bulb. Unlike the Globe Electric model, there is a bulb included. It is a 4w LED, medium base bulb(40w equivalent). The lamp itself can hold up to a 40w LED which is equivalent to a 200w incandescent. The manual clamp is tight on any surface and maintains a minuscule footprint to maximize desktop space. For those on a tight budget and looking for a decent product that will work as needed with little fuss, the LEPOWER Clip-on light could be your answer. This light features a fully adjustable neck and two power toggles. The first toggle turns the light off, selects warm light or white light. The second toggle selects dim or bright. The spring clamp is strong and will open to accept any mounting edge up to two inches thick. If you need a reliable clamp lamp that won’t break the bank, plus offers adjustability both in lighting and angle, the LEPOWER is one to seriously consider. Regardless of what you personally need form a desk lamp, the most common requirements are mounting, cost, adjustment abilities, and energy consumption. Beyond that you are looking for style and any features that make the lamp unique. Is the lamp functional? Will it illuminate your entire desk, or will you need to purchase a bigger lamp for your large desk? Our list above should offer suggestions for all manners of design, features, needs or wants. The best of the best, in my opinion, is the TaoTronics LED desk lamp. It offers fine-tuned adjusting, various color tones of light as well as brightness levels all built into the design. The stand is sturdy and won’t take up much space either. However if you find that it isn’t quite right for you then I know there’s one in this list to you’re your needs. Just pick whatever lamp fulfills your needs the most and enjoy making your awesome artwork under the warm glow of your new desk lamp. JT is a ghostwriter, novelist and screenwriter. 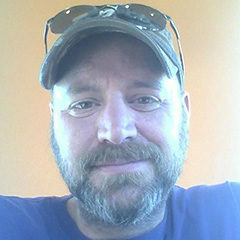 He loves making words convey more than just a message and helping others find their passion with the written word. You can contact him through his website.